Archibald Baxter was one of a number of New Zealanders who refused to join the military and fight for Great Britain in its war against the Central Powers. This trust has ambitious plans to honour Baxter and other conscientious objectors from New Zealand during these centennial years (2014–18). These include the creation of a memorial garden, an annual peace lecture and an essay competition for secondary school students. The Archibald Baxter Memorial Trust was proud to host Maire Leadbeater for the annual Peace lecture in September 2018. 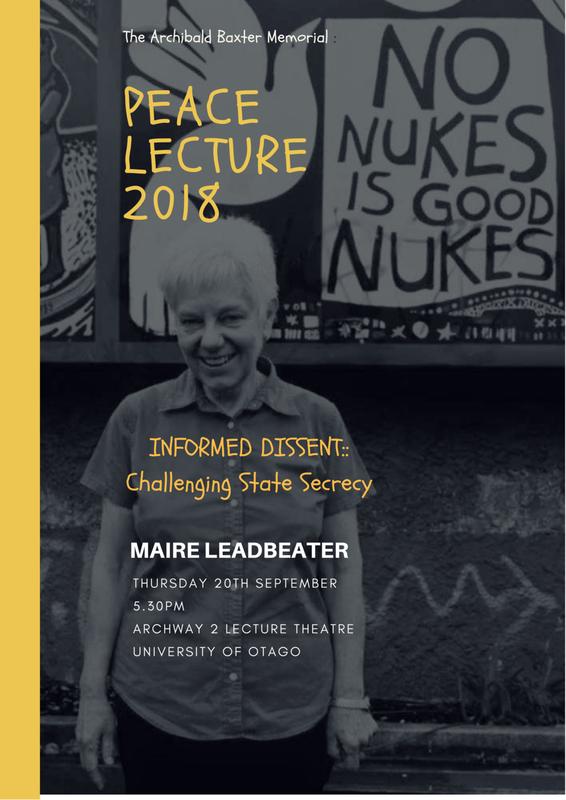 Maire Leadbeater is a prominent New Zealand peace activist who was a key player in the CND movement in the 1980s. She has also played an active role in several human rights campaigns in the Pacific, most notably the East Timorese struggle for independence during the 1990s and the ongoing struggle for freedom and democracy in West Papua. Maire Leadbeater is also a highly regarded author who has written on the history and politics of the peace and independence movements she has engaged with. Her most recent book, 'See No Evil: New Zealand's betrayal of the people of West Papua', provides a critical insight into the New Zealand government's complicity with Indonesia's brutal repression of West Papuan people standing up for human rights and democracy. Maire Leadbeater's research into these topics has involved detailed scrutiny of the New Zealand state, and how it hides information and avoids accountability for the role it plays in the international arena. It is this research which provided the content for the 2018 Peace Lecture: Informed Dissent. She argued for the importance of peace research in challenging state secrecy. Members of the Archibald Baxter Memorial Trust with Maire Leadbeater. From left: Richard Jackson, Paul Sorrell, Tony Eyre, David Grant, Kevin Clements, Alan Jackson. Stevan Eldred-Grigg lecture: Why go to War? NEW ZEALAND WAS NOT THREATENED with invasion by any overseas state in the two world wars. Yet we chose to go to war anyway. Why? Our governments in 1914, 1939 and 1941 gave several reasons for going off to fight countries in Europe and eastern Asia. One set of reasons was supposedly based on rational or ‘hardheaded’ thinking. War would safeguard the country against armed attack; likely attackers were believed to be ‘Huns’ in 1914, ‘Nazis’ in 1939 and ‘Japs’ in 1941. War would also safeguard the New Zealand people by protecting the New Zealand economy. A second set of reasons was more ‘softhearted’ or based on emotion. War would safeguard freedom and democracy both at home and throughout the world. War would be a way of showing duty and loyalty to Britain, the ancestral homeland of a majority of New Zealanders. All of those reasons need to be interrogated closely. We need to ask whether the decision to go to war was actually in the best interests of the people of New Zealand. Was going to war good policy? Or was it quixotic? The Archibald Baxter Trust is pleased to observe that historian Tom Brooking delivered the annual Peace lecture. Tom Brooking is a notable historian who teaches WW1 history at the University of Otago. His lecture 'Passhendaele's Shadow' explored the tragic events of the Third Battle of Ypres and thoughtfully explored a range of questions relating to the human and societal costs of WW1. The Peace lecture took place on the United Nations Day of Peace, Thursday 21st of September. A near-capacity crowd at Dunedin Town Hall on Saturday evening gave a prolonged standing ovation to a stunning performance by the City Choir Dunedin, Dunedin Symphony Orchestra and soloists under the direction of David Burchell. Museum Reserve. In 1917, with 13 fellow conscientious objectors from Otago, Baxter was deported to the Western Front on the troopship Waitemata and subjected to threats and physical abuse for his refusal to serve in the army, culminating in his subjection to Field Punishment No. 1. He remained deeply opposed to war throughout his life. The competition was organised by the Archibald Baxter Memorial Trust, and the judging panel included Trust members, members of the Baxter family, representatives from the Dunedin City Council and the Dunedin School of Art at Otago Polytechnic. Alan Jackson, the trust’s honorary secretary, said that the completed memorial will honour Baxter and his companions in a reflective sculptural setting that will offer visitors the chance to contemplate their sacrifice and consider alternatives to war.He added that at present there is no memorial in New Zealand to Baxter or indeed any of the country’s conscientious objectors in any war. Mr Jackson said that the three finalists were chosen from a very strong field following a rigorous selection process. They are sculptor Peter Nicholls of Dunedin; the Baxter Design Group of Queenstown (no relation to Archibald’s family); and metal engineer and sculptor Lawrie Forbes and sculptor Stuart Griffiths, both of Dunedin, who submitted a joint entry. Each finalist has been given $1500 to progress their design and they have until 31st January 2016 to complete their revised submissions for the selection of the winning design. The winner will receive $15 000 to develop the design to the final stage with ‘every i dotted and t crossed’. The trust hopes that the memorial will be in place by March 2017 to mark the 100th anniversary of Baxter’s arrest in Dunedin. Mr Jackson added that further information about the trust and the memorial can be found on the trust’s website, where supporters would also have the opportunity to donate to the considerable costs involved in the project. The annual Archibald Baxter Memorial Lecture will be delivered this year by Prof David Tombs (Howard Paterson Chair of Theology and Public Issues at the University of Otago) on Monday 21st September at 5.15pm at the University. David has worked in Belfast on Peace and Reconciliation and has led several successful seminars here since he arrived in late January this year. His theme for the Lecture is Torture. The prizes for the school essay winners will be awarded at the same time. Former Prime Minister Helen Clark is to be the Memorial Lecturer next year. Welcome to the Archibald Baxter Memorial Trust online. Archibald Baxter is New Zealand’s best-known conscientious objector, and father of poet James K. Baxter. Archibald steadfastly endured the suffering caused by his decision to reject military service during the First World War. Transported to France and exposed to the horrors of frontline warfare, Archie and his fellow objectors have left New Zealand a legacy of principled resistance to war that is today more relevant than ever in our conflict-ridden world. The trust has ambitious plans to honour Archibald Baxter and other conscientious objectors from New Zealand during these centennial years (2014–18). These include the creation of a memorial garden, an annual peace lecture and an essay competition for secondary school students. The inaugural Archibald Baxter Memorial Lecture was delivered on Monday 22 September at 5pm in the Archway 1 lecture theatre at the University of Otago. The lecture was given by Prof Henry Reynolds of the University of Tasmania, who has written extensively on the conflict between European settlers and indigenous peoples in Australia. His latest book isForgotten War (2013).